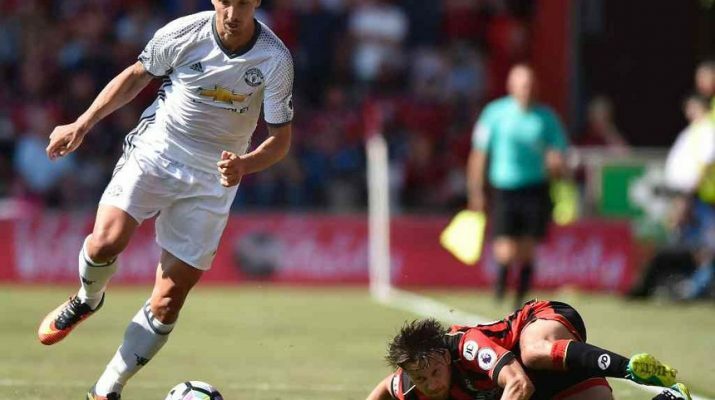 Ibra scores as Mourinho starts with Manchaster United victory – Kenyatta University TV (KUTV). All Rights Reserved. Jose Mourinho’s first Premier League game as manager of Manchester United ended in a comfortable 3-1 victory away to Bournemouth on Sunday. Juan Mata scored the first league goal of the new era in the 40th minute following an error by Bournemouth captain Simon Francis and Wayne Rooney headed the second just before the hour. Zlatan Ibrahimovic, who headed the winning goal in last weekend’s Community Shield game against champions Leicester City, then marked his league debut by scoring with a low drive from 25 metres. United, without world record signing Paul Pogba who was suspended, were denied a clean sheet soon afterwards when defender Adam Smith beat David de Gea with a fierce shot from 12 metres. But Ivorian defender Eric Bailly made his Premier League debut and midfielder Henrikh Mkhitaryan was introduced for the last quarter of an hour as the first Armenian to appear in the cosmopolitan league. Ibrahimovic, in contrast to the 89 million-pound Pogba, cost nothing and was able to maintain his reputation for scoring in a first game in a new league. “The first objective is to win,” he told Sky Sports.”The second, if I can, is to score. But if I score it’s a bonus. Rooney said the combination of four great signings, plus a new manager, would mean “lots of excitement” for United fans, many of whom had been critical of what the team’s uninspiring football under Mourinho’s predecessor Louis van Gaal. Dismissed by Chelsea last December, Mourinho took over after the Dutchman was sacked at the end of his second season despite winning the FA Cup in his final game. Bournemouth manager Eddie Howe felt the defensive mistake for the first goal undermined his side after a promising start. “I thought it was an even game until the first goal, that was the key moment,” he said.